Less than four months ago, former UFC middleweight champion Anderson Silva snapped his left shin in two when Chris Weidman checked his kick. On Saturday at GLORY 15, it was like déjà vu all over again for combat sports fans. 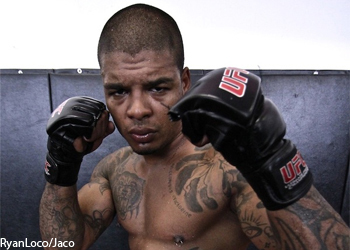 Tyrone Spong (pictured) shattered his right shin when Gokhan Saki checked his kick in the opening round of their light heavyweight tournament finals matchup. Spong instantly dropped to the canvas and the scrap was called. Saki, who was just as disappointed as everyone else in what took place, captured the kickboxing crown with the TKO victory. Spong is the best kickboxer who is currently attempting to crossover into mixed martial arts. He owns a 74-7-1 (1 NC) kickboxing record, and is unbeaten in both of his MMA fights for World Series of Fighting. The Blackzilian was hoping to return to WSOF later this summer, but this injury will set the 28-year-old back at least a year. GLORY 15 took place inside Ülker Sports Arena in Istanbul, Turkey.